Paddy Power's marketing machine is on the ball again. Russia will be cheered on by an unlikely set of supporters in their World Cup opener against Saudi Arabia tomorrow, as the LGBT community back the notoriously homophobic nation for a great cause. For every goal the host nation scores, Paddy Power will donate £10,000 (€11,350) to a number of causes dedicated to making football more LGBT inclusive. If Russia fail to score a single goal during their own home tournament, Paddy Power have guaranteed a minimum donation of £50,000 just to be on the safe side. Several celebrities including ex-Olympian Caitlyn Jenner, Welsh rugby legend Gareth Thomas, actor Christopher Biggins and choreographer Louie Spence have now come out in support of the tongue in cheek #RainbowRussians campaign. A Paddy Power spokesman said: “Given they invented Russian Dolls, you’d be forgiven for thinking Russia wouldn’t have an issue with women being into other women. “Likewise, their appreciation for bears is one shared around the world by the LGBT+ population, so it really is astonishing that they have not used their stewardship of this tournament to champion LGBT+ inclusivity. “As a result, we’ve stepped in to help. 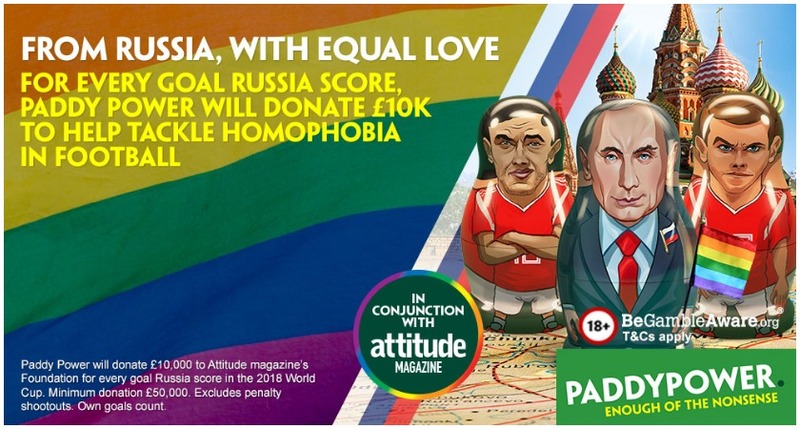 When Russia Put-in a goal, we’ll Put-in £10,000 to Attitude magazine’s Foundation - who will use the funds to make football more LGBT+ inclusive". Darren Styles OBE, publisher of Attitude, said: “When Paddy Power approached us with this idea we leapt at the chance. "The LGBT+ community has a long history of reclaiming and adopting behaviours, words and styles that were intended to discriminate against us, so for this tournament we’re adopting Russia. “The World Cup is meant to be about inclusivity, but thanks to the hosts – and those who chose the hosts – this tournament (and the next, in Qatar) is taking place in a nation with laws that discriminate against the LGBT+ population. “This is completely unacceptable and, therefore, we welcome the opportunity to benefit from Russia’s success and make unwitting allies of their national team.